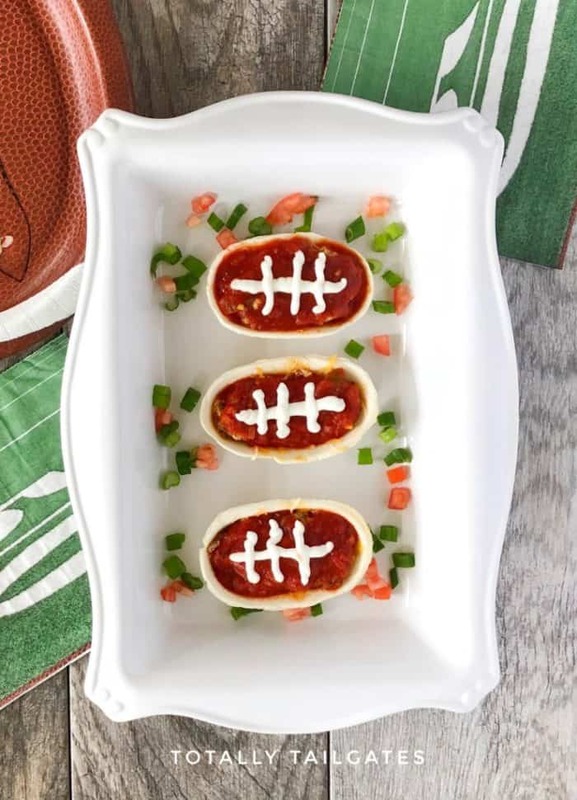 Football Taco Bowl Bites are hearty appetizers and are always a hit for game-day parties. They are like a seven layer taco dip….in your hand! The Super Bowl is this weekend, and creating a robust menu of appetizers is ALWAYS front and center on my mind! Being a food blogger, the pressure is ON to bring “that” dish everyone devours. Couple that with the fact that my food niche is tailgating, and let’s just say Super Bowl Sunday is my biggest blogging (and eating) day of the year! 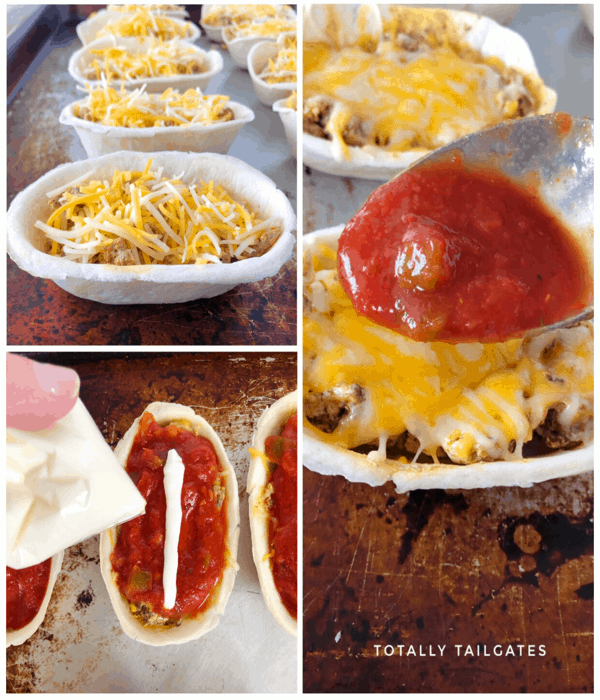 These taco bowl bites are very easy and the flavor combinations are what we all crave during football parties. I used to serve a seven layer dip on game days, but the dip tended to get messy in the casserole dish after a few people helped themselves. I’ll be frank: the casserole dish became downright unappetizing! So, I set out on a quest to develop a bite sized taco dip that had the flavors I wanted without that mess. 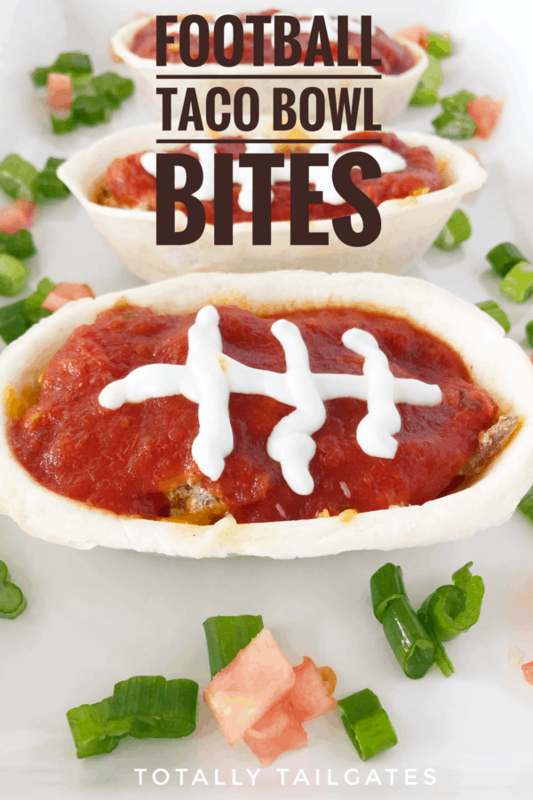 These taco boats are easy to hold and can be eaten easily in two or three bites. They are SO good – the secret sauce is incorporated into the meat. You will note the guac and sour cream layers are missing – this was intentional to keep the taco bowls in tact without runny mess. If you miss ’em, feel free to add them back in…..just keep some napkins nearby! 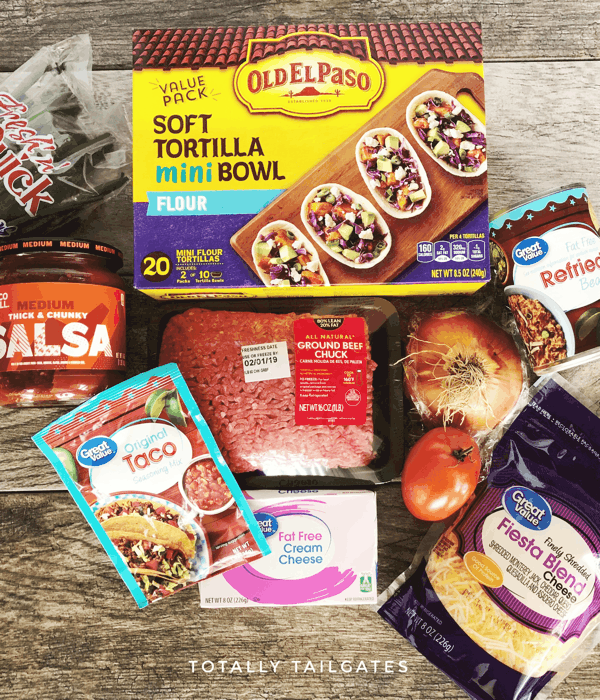 The Players on the Field: ingredients to make football taco bowl bites. First, you will brown the hamburger meat and cook it according to the package directions. Once it is cooked, add a whole block of cream cheese. The seasoned meat becomes so creamy – this is my secret ingredient for this appetizer! I’m guilty of dipping a few chips straight into cream cheese & meat mixture! While the meat and cream cheese are melting and becoming BFFs in your pan, put the refried beans, water & onion in a small saucepan. Let them heat until the beans are creamy and the onions are soft. Then, it is time to make the taco boats! Place a layer of refried beans in the bottom of the flour tortilla followed by a scoop of taco meat. Top with cheese & melt in a 325 degree oven. 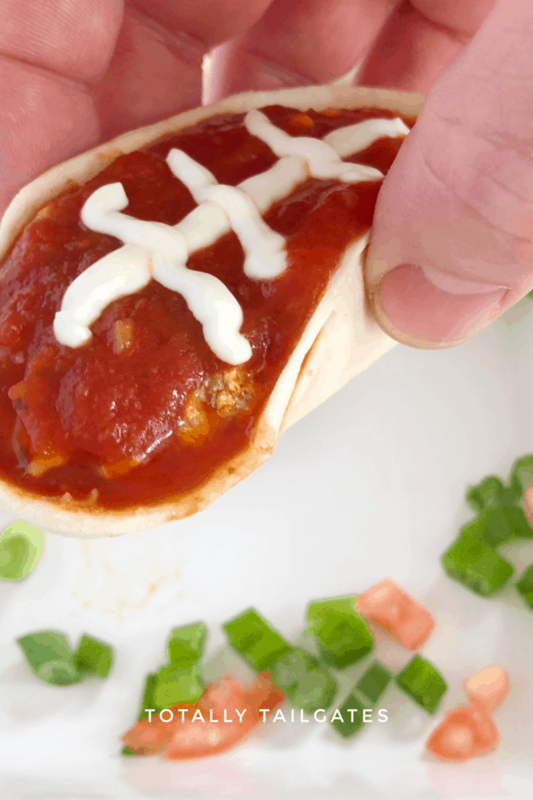 Once the cheese is bubbly, top with salsa & make football laces out of sour cream. TOUCHDOWN! Adding water and onions to the refried beans upgrades their taste and consistency. When the meat is browning, break it up into small pieces with your spatula. Use two cookie sheets to make the full batch (20 boats) at once. I fit 10 flour tortilla boats on one large sheet pan. Thick salsa works best for this recipe. A thinner cantina style sauce is too runny for the boats. Get the kids involved on game day! Put the taco meat, refried beans and cheese in separate bowls with a spoon in each. 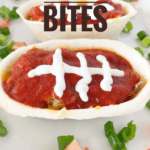 Let the kids have fun scooping and filling their Football Taco Bowl Bites! They can even place them on the cookie sheet, but have an adult close by to transfer the taco boats to the oven. For those who want to savor the taco boats instead of gulping them down, have a few chips around! I’d love for you to tailgate with me! Stop by the blog (Totally Tailgates) or follow along with me on Facebook. 🙂 Happy tailgating! Taco bowl bites are a fun and less messy way to enjoy 7 layer dip without the mess. Brown and drain hamburger meat. Prepare with taco seasoning according to package directions. Add cream cheese and heat on low until cheese is melted and the mixture is creamy. While the meat browns, pour refried beans, water and onions into a saucepan. Heat on medium heat until thoroughly heated and the onions are soft. Open tortilla boats and place 10 on an ungreased cookie sheet. Spread a spoonful of refried beans into the bottom of each. Top with a heaping scoop of meat and then a generous sprinkle of cheese. Heat in oven until cheese is melted - about 5 minutes. While the cheese melts, place sour cream in a zip lock baggie & snip a very small section off one corner. You will pipe the football laces on the taco bowl bites with the sour cream baggie. Remove boats from oven. Spread salsa on top of each boat. Squeeze sour cream on each boat to resemble laces.Sprinkle green onions and tomatoes around the boats if desired. Repeat process with remaining 10 tortilla boats.